Discussion in 'IEMs and Portable Gear' started by takato14, Jul 14, 2016. The EX1000 is a former flagship IEM released by Sony, only recently discontinued. It features a side-firing 16mm dynamic driver, which is pretty large for an IEM. The form factor of this headphone is a bit peculiar, and they are very visible when worn (I find this a positive rather than a negative). Despite this, they are by far the most comfortable IEMs I've ever used. Comfort has been a huge thing keeping me from pursuing in ears, and these are a huge winner in this regard. 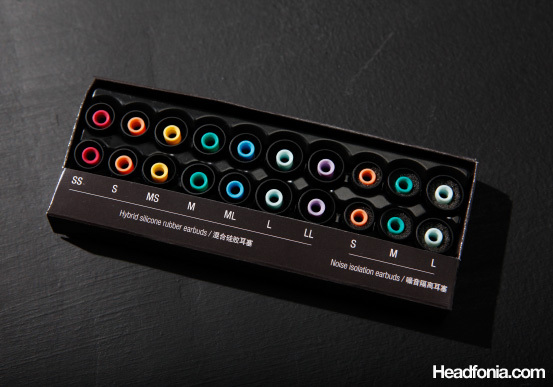 They come with a plethora of high quality silicone tips to choose from, with 7 different "hybrid" sizes as well as 3 sizes of tips with additional foam under the silicone to increase isolation for noisy environments. All tips are color-coded by size with the colored portion being the sleeve which goes over the nozzle, which I found clever. Image courtesy of Headfonia.com as the original packaging was not included with the pair I have. The cable on these is a bit soft, which has me worried as I'm reminded of cables that lasted exactly 5 days before having to be replaced with a similar feel to them. It has bendable cable leads at the earphone side, which makes them easy to customize to fit your ear. The cable is also detachable and has a very nice proprietary plug that won't come off on accident. I'm just speculating on cable durability, but even if I'm right the official cable is still readily available, as are DIY plugs that enable you to make your own. Build quality of the housing is very solid. The black portion of the housing is magnesium alloy, while the charcoal gray is a very stiff glossy plastic. The cable detachments are a secure screw-on design and don't move even in the slightest when properly attached. Very solid feeling throughout. It quickly became apparent to me that these are not a intended to be a deep-insertion IEM, after instinctually cramming them into my skull. I guess my ER-4 days weren't as far back as I thought. The deeper they're inserted the less comfortable they are, and it seems to interfere with the bass as well as making the treble sound sharper. Personally, I got the best combination of sound and comfort from the SS (extra small) silicone tips, inserted partially. Once I did this, I was greeted with a shockingly comfortable fit that allowed the headphones to eventually disappear entirely. That being said, these do not isolate on the level of a deep insertion IEM like the ER-4. If you need super good isolation, these won't fit the bill, unfortunately. These things are damn good. Super coherent and tight sounding while being wonderfully balanced and neutral. I found these to actually sound quite competent out of less-than-ideal source material such as my laptop, a little soft/passive and smoothed over, but definitely more than tolerable. Clear, refined, pleasant and linear. Honestly, my laptop was the first source I used these with and my first thought was "why do people think these are bright?" I had trouble noticing the reported sizzle to the lower treble/upper midrange during these tests. All I really heard was fantastic treble extension and maybe the occasional "plasticy" timbre with the wrong song. Switch to the Geek Out 450, holy crap. Now it's slamming super hard with an enormous 3-Dimensional soundstage and tons of resolution everywhere. Very engaging and dynamic sounding. They're also now sounding a tad sharp as others have said, but its hard to tell how much of that is the GO and how much is the EX1k. Whatever the cause, it's far from unlistenable for me. Depending on the track, it can range anywhere from being indistinguishable, to sounding only slightly plasticy, and finally stopping at moderately uncontrolled and sizzly. I've heard worse from an AKG Q701, for sure, and that was never particularly sharp sounding to me, even out of an O2/ODAC. Upper FR anomaly aside, these are one of the most neutral IEMs I've ever used. The Etymotic ER-4S was brighter than these are for sure. Midrange and bass tone is spot on, neither warm nor lean, and very well integrated to where there is not a clear distinction between them. This characteristic is not one that is easily found, in my experience, and only one other headphone I've heard does it this well. There are numerous other IEMs from sony with this form factor, notably the EX600, EX800ST, and MDR-7550, none of which I can recommend over the EX1000. The 1k is the special one for sure. I'm a bit hard to please, especially with regards to in ears, but these are really enjoyable. Favorite IEM by far. Hell, screw favorite IEM, these are arguably better than each of my home headphones in some way and have been monopolizing my ear time since I got them in the mail. jafnvaegi, Stuff Jones, TwoEars and 16 others like this. Excellent write up. I'd like to add one thing, you can heavily eq these and transform them into basshead IEMS. They are in my top 5 right now, sitting comfortable in the number 5 spot overall. Even when transformed, they are still super clear. Very enjoyable IEMS and very flexible, sound wise. I have the upgraded cable for the Z5, not sure if they are the same though. I did order a new cable from PETEREK. Should have it before end of this month. Hate that damn cable. I really want people to hear the Akazakura by Ocharaku. It's by the same engineer that developed the EX1000 and shares a lot of it's sonic qualities but with better treble response IMO. Maybe when i get back from my buddy I can send it around if people are interested. takato14, Warrior, sphinxvc and 1 other person like this. I have a budget of around $600 for some IEMs. I have been looking at the Sony MDR-EX1000 which is around $400 on Amazon. I have also been looking at the Shure SE535. Does anyone have any other recommendations on IEMs that I should consider? I listen to hard rock like Rush and Def Leppard, southern rock like ZZ Top and 38 Special, Blues/Jazzy stuff like Norah Jones and Megan Fanning, and techno stuff like Yazoo, New Order, Kraftwerk, and Daftpunk. So far, I am leaning towards the Sony that you have so thoroughly reviewed. Can anyone share their experience and wisdom in helping make a recommendation? Hell yes, please. Let @sphinxvc know and it will happen! recarcar and takato14 like this. What is your source? The ex1000 likes power. Can confirm that these do indeed like power. Quite a lot better than unamped even with the meager Geek Out 450. I'd love to try these out of something bigger. Sounds good. Should have it back in a couple weeks and I'll let @sphinxvc know when I do. Kunlun and sphinxvc like this. 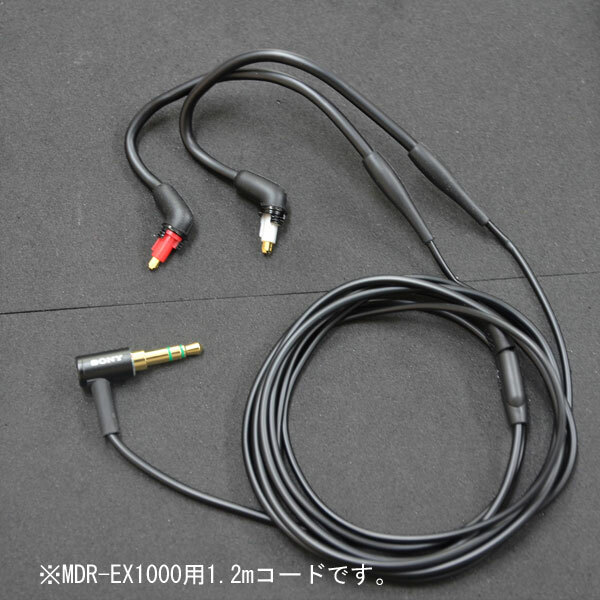 My source is a Pioneer XDP-100R-K dap. BTW, I'm noticing that lot of people like to call these bright. This is entirely false. They aren't bright, but they do sound sharp around the 3-5kHz range. Think HE-6 etch. The sharp quality gets worse with both higher volume and deeper insertion, and appears to be related to some driver-borne resonance at around 5kHz judging by Tyll's plots of these. It's relatively unnoticeable when worn correctly, in my experience. I have owned a pair of EX-1000 for quite a while and they have stayed among my IEM favorites ever since. There is so much to like here; articulate bass (as IEM's go), transparent midrange and generally linear sounding response along with low perceived distortion. The most significant down side is some treble bizarrity that can make some instruments in their higher ranges sound a bit more "insistent" than they should. But overall, whenever I listen to them, their positive qualities win the day. To my thinking, they exist in that world just below the very best with the extra benefit that they have relatively few peculiarities. The EX-1000 strikes me as an IEM that some will enjoy more than others and probably few would proclaim as "the best". But it's also likely that few would run screaming from the room on audition, either. I hope to hear some of the current contenders for "very best" IEM. Currently, the Campfire Audio Jupiter/Andromeda comes foremost to mind. In the meantime, having the steady EX-1000 around is always a good fallback position. For me, its quality and consistency, along with its fairly reasonable price, makes it an easy recommendation to others and a keeper in my personal IEM inventory. How do these compare to the Andros? Just got the EX1000s and was able to compare them to a few of the more modern multi-BA IEMs (1964 A10, A5, U8, Campfire Jupiter) in HK stores, all running off a HM650. So how does the ol' Sony stack up? Bass slam and dynamics is ACE. There's no replacement for big (relatively) dynamic drivers in this regard, these can move a huge amount of air if needed, and is also relatively clean + doesn't bleed, there is a little detectable roll-off, but overall provides texture that ranks up there with the best I've heard from an IEM. Soundstage and separation is very good, especially left-right, stage size is more like a full-size headphone than a IEM in this aspect. A tad hard-panned left-right however. Generally appears to be very dynamic, makes quiet sections of music quieter and louder sections louder. Some FR peakiness in the treble, combined with the above trait, can make sibilant stuff/not so great masterings a bit hot in the treble, I'm personally okay with this, and it's not actually a massive amount, but some people might get turned off. Slightly wider stage than u8 maybe? Less dynamic range, which might not be a bad thing, as it can increase apparent detail. Despite the EX1000 being near 6-years old, single DD, and by far the most affordable of the bunch (Jupiter is the cheapest at near $1k USD list in HK), these Sonys keep up very well, the BAs may be better for all-round use due to some non-audio factors, but the Sony is compelling in some ways that they can't match, for those that are sick and tired of million-BA, million $ flagship IEMs that are being pumped out nowadays, consider the EX1000. P.S: Consider "warmer" sources/EQ to tame the 7khz peak, it can get pretty hot otherwise, also, these things love power and the bass slam is seductive enough to crank up volumes to very loud levels, so watch your hearing fellas. deafdoorknob, eddypoon, alucart and 3 others like this. I remember loving these when I listened to them. Thanks for this thread, I need to find a pair. Since they're apparently discontinued, which retailers still sell a legit pair yet are willing to ship internationally? Finally had time to get to them. No mistaking, a dynamic driver, unless I am totally wrong. Almost feels to be a relief - coming from listening to BAs. Really nice timbre and bass clarity. However, FR has a midrange honk combined with sometimes nasty sharp treble peak and some shh-sizzle up top. Sort of like a SRH1440 with that honk and shoutyness, extra treble spikes, but with more bass. I bought the Japanese version awhile ago just off the basshead thread recommendation from head-fi. It sounded like a slightly bright, airy mid-fi to high-fi sounding IEM with little bass. That's usually how it was reviewed for the North American version. I got nothing even remotely close to the basshead shaking review I read. Then again, there is absolutely nothing distinguishing the bass heavy Japan branded -J version vs. the bass light one made for North America outside the actual box. Anyone tried the -J version & heard the difference between the NA version? I have the Japanese version. You need to heavily eq it. Stock, it's not basshead at all. With eq, it hits very hard.